VISIONS OF THE NORTH: Amelia Earhart's Freckle Cream? The recent conference, held under the auspices of TIGHAR, on new evidence as to the disappearance of Amelia Earhart, was packed with fascinating material, particularly on the last few possible wireless signals from her aircraft. Yet the thing that most caught my eye -- and perhaps, thanks to my fascination with Sir John Franklin, I am simply "relic crazy" -- was this broken glass jar, which has been tentatively identified as having contained anti-freckle cream. 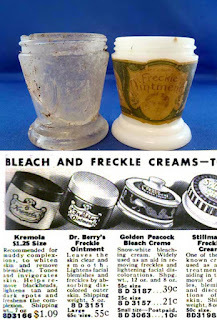 As those at the conference noted, Earhart was self-conscious about her freckles, and might well have used such a product; researchers using the glass container's distinctive shape have linked it to Dr. Berry's Freckle Ointment, a long-gone cosmetic product sold in a similarly-shaped jar. It's not an exact match -- the jar of this product is of milk-glass, not clear -- but it certainly is striking, the more so as one of the fragments of this glass shows signs of having been used as a tool. But as an historical researcher, I had questions about this identification right away. Milk-glass, I knew, was at its peak of popularity in the 1890's and the first decade of the 20th century, well before Earhart's flight. 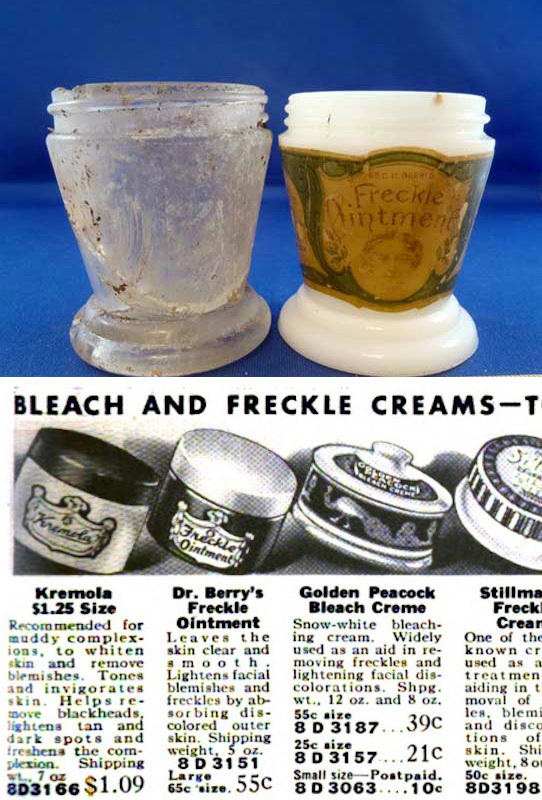 And, as other bloggers had noted, the form of Dr. Berry's ointment sold in these jars was banned around 1912 due to its high mercury content. Dr. Berry's apparently reformulated their product, as it continued to be sold for some years thereafter, and would indeed have been available to Earhart in 1937. However, even in a clear jar, this sort of thing did not look like a 1930's-era product to me. Fortunately, thanks to the vast digitization project of the Hathi Trust, I was able to find a 1936 Sears Catalog which included Dr. Berry's ointment among its products, and as I had suspected, it was shown in a pillbox-style cylindrical container with far more modern lines. I suspect it hadn't been sold in the large glass jars for some time, and it's hard to imagine that Earhart, a woman who -- however much she may have disliked her freckles -- was very fashionable and had endorsed many "modern" products, among them a line of luggage (my family still has one of 'her' suitcases) would have deliberately brought along an outdated, heavy glass jar of such cream when a compact modern one was available. I could be wrong. It might be that, after the popularity of milk-glass faded, Dr. Berry's continued to sell its product in clear glass jars. Earhart, perhaps for sentimental reasons, might have brought this sort of jar along. It may even be possible that, as with other products of this type, some people preferred to have the old jar filled with the new product at their local pharmacy. But alas, despite the freckled connection, this piece of evidence remains, I think, of uncertain value. Google honoring Amelia Earhart an American aviation pioneer on her 115th Birthday with special doodle.